Dondakaya aka Tindora/Tendli is available all round the year and is a regular in our kitchen. I made a simple and comforting rice dish featuring dondakaya as the star ingredient. The combination of dondakaya and fresh coconut is eternally comforting especially as a stir fry. Perfumed with whole garam masala, spiced with green chilies, sweetened with coconut, Dondakaya rice recipe is jazzed up with a squeeze of fresh lemon and brightened with fresh coriander. All you tindora haters, I encourage you to try Tindora rice which is sure to get your tastebuds dancing. 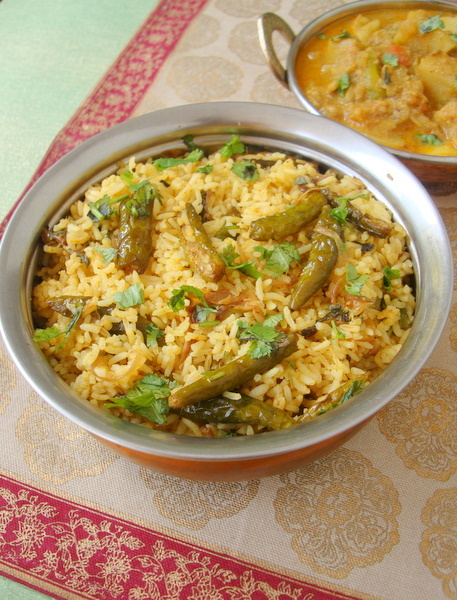 I served the Tindora rice with our favorite Aloo kurma, the recipe of which I will post soon. Its a slightly different version of the Aloo Kurma recipe I posted earlier. Heat 1 1/2 tbsp oil+1/2 tbsp ghee in a cooking vessel, add the halved dondakayalu/tindora and saute on medium flame till well roasted, approx 15 mts. In the same vessel, add the remaining oil. Add whole spices and bay leaf and saute for half a minute. Add the sliced onions and saute for 6 mts. Add the ginger garlic paste and crushed coriander-pudina-green chillis and saute for 3 mts. Add the coconut paste and mix. Saute for 2 mts. Add coriander pwd, cumin powder, tumeric pwd and red chili pwd and mix. Add the sauteed dondakayalu and mix. Cook for 7-8 mts. Add the cooked rice and salt to taste and mix. Place lid and cook on low flame for 2-3 mt. Add lemon juice and mix. Turn off heat and remove onto a serving bowl. Garnish with fresh coriander leaves. Serve warm with raita or any curry of your choice. Vegans can omit ghee/clarified butter and use only oil. If you do not have pudina on hand, omit it. But fresh coriander is essential for this recipe. Tindora rice will taste good even without coconut paste. 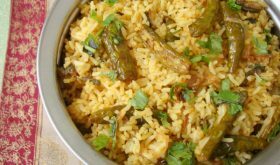 Put the rice to boil and start the preparation process like slicing tindora, crushing green chilies, making coconut paste and slicing onions. By Sailu Published: February 13, 2012 I made a simple and comforting rice dish featuring dondakaya as the star ingredient. 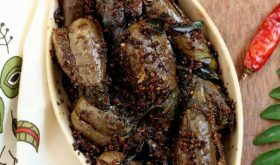 Perfumed with whole garam masala, spiced with green chilies, sweetened with coconut, Dondakaya rice recipe is jazzed up with a squeeze of fresh lemon and brightened with fresh coriander. Wow… Thanks for the recipe. Would surely try it. can feel the taste of the dish as you explain the ingredients 🙂 nice clicks too. Thanks for sharing. Tried it today. My husband and I loved it. Made this today. It tastes great. Will try out other recipes on the site soon. Thanks for sharing this recipe. Sailu, I made this for dinner yesterday with onion-capsicum raita on the side. There were no leftovers..Thanks for another keepsake recipe. 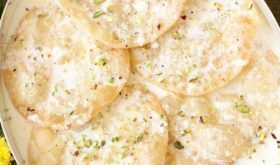 sailu i really love your recipies please….post the aloo kurma recipie ( the slightly different version) which u mentioned as early as possible. sailu garu, its a too good recipie.. i tried it and i liked it a lot. thank u so much…keep posting..
Great recipe, thank you for sharing and looking forward to trying it soon. 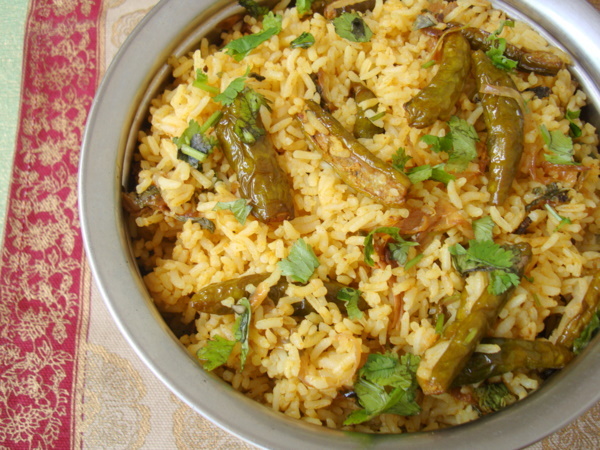 I never knw that rice dish can be prepared frm Ivy gourd, Will surely this for this diwali …. 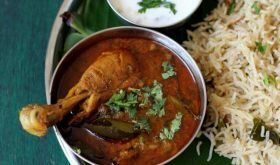 Tks a ton…..
Hi Sailu garu, i tried this recipe today when my grandparents were visiting me. This came out so well and me and my entire family enjoyed this. I got a lot of compliments from my grandparents too. Thank you for such an easy and wonderful recipe! Tried this recipe today.. was yummy 🙂 Thank you.. This was a great tasting dish, didn’t expect out good old dondakayi to be liked by my northie husband. I will try this with gobi also, I guess that will turn out good as well.